Client: Durrat Khaleej Al Bahrain Co.
Barr area at the Southern- Eastern coast of the State of Bahrain, on the Arabian Gulf and has an approximate area of 55,000.00 m2 and forms part of the recreational facilities within the future residential and Touristic City Durrat Khaleej Al Bahrain. Wave Pool, Bumper Boat, Children Interactive Pool, Tot's pool, High Thrill Ride, Inner Tube Ride, Vortex Pool, Flow Rider and the most recent Multilane Slide. Volley-ball courts with many Fast Food Outlets, (each of its own colored Patios) and varieties of shades (in different shapes & material). A scenic landscaping and hardscaping featuring Grottos, entrance pergolas, fountains , waterfalls and islands all accessed by a multi colored and textured paved walkways connected by wooden bridges and lit by decorative lighting fixtures. All external and internal utilities were provided within attractive buildings and structures. Potable and Fire Fighting water system. Fire Alarm and Security System. 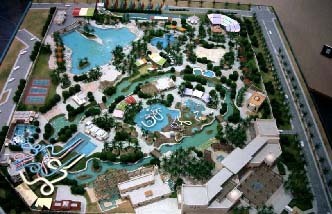 Amusement and Rides; Hardscape and Landscape.